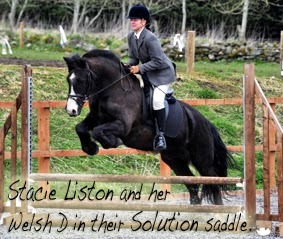 Solution Saddles Customer Stories: Solution of the Month October 2014 – "Stacie Liston Needed a Secure Jump Saddle for Her Bold ISH". 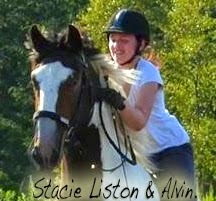 Solution of the Month October 2014 – "Stacie Liston Needed a Secure Jump Saddle for Her Bold ISH". “I wanted to share my story to say thanks, I am so pleased with my new SMART Jump saddle. I like to think that I have found my perfect 4 legged partner in crime in Alvin my lovely ISH. I was lucky to find him locally after deciding that new challenges were needed in the form of a new horse. I’ve been fortunate enough to have had a previous Solution saddle for 10 years which I have used on all my horses. My Highland & Welsh were both very different in shape and using the Solution saddle made life simple for me; with a change of pads for each of them and I was set to go. It never even crossed my mind to go back to a tree’d saddle for backing Alvin and I believe that using my RigidFree saddle is what made him so easy to back. When the time came to introduce jumping I knew that I would need a suitable saddle to do the job. Alvin can be quite ‘bold’ so I needed a saddle that would offer a very secure seat. I got in touch with my local Solution Saddles Technical Advisor, Catie Baird, who was able to bring a selection of saddles for me to try - and I was sorted with a new SMART Jump saddle that afternoon! 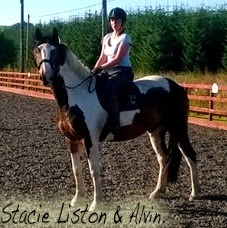 My physio has commented on how beautifully balanced and soft Alvins muscles are in his back, and when you see him cutting shapes when playing in the field you know that he is happy and pain-free in his movement. You certainly get what you pay for from Solution Saddles and I joke that my new SMART Jump saddle cost more than my sofa - but I spend more time sitting on my saddle! Now to go out and start winning some ribbons! Thanks Solution Saddles for challenging the norm and offering an alternative to tree’d saddles.